Suman sa Morón ~ I Can Do That! This is the third time I made this kind of suman and unlike the previous two [inedible] suman sa moron, this recipe I adapted from here is the best and most probably the most authentic. I'm not from the Visayas region where this type of suman comes from and didn't have them back in the Philippines either. 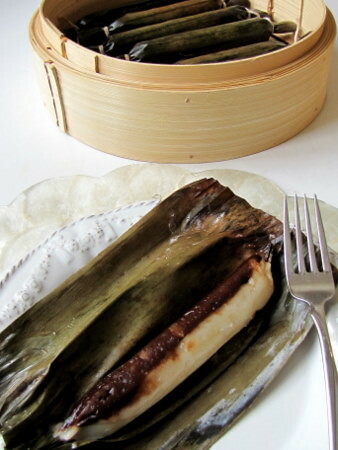 But I can honestly say this recipe makes the most delicious and very soft suman with a strong smoky chocolate flavor (from Antonio Pueo tablea) and this suman is now on our list of all-time favorite Filipino treats. I can't stop eating them; they're great as a snack and for breakfast with barako coffee or hot ginger tea. 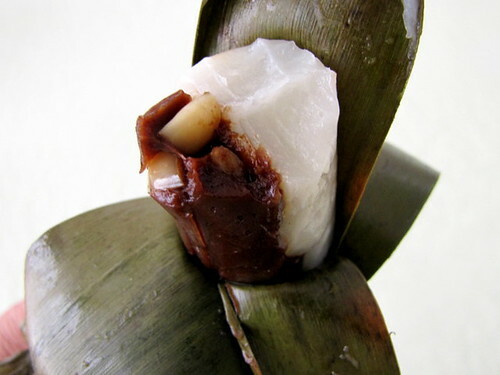 Suman sa morón is a cigar-shaped two-toned rice cake made with both glutinous and regular rice flours cooked in coconut milk, sugar, chocolate, and peanuts, wrapped in banana leaves and steamed for an hour. The recipe has julienned cheddar cheese added to the chocolate portion but I omitted it. I don't know the exact amount of chocolate to substitute for the tablea if you can't find them in your area. You can start with 8 ounces of semi-sweet or dark chocolate and just eyeball the color and texture, taste the cooked paste, and adjust to your preference. With a wire whisk, thoroughly mix the 2 types of flour and divide equally into two parts. In a non-stick wok, place one part of the rice mixture, add the sugar, whole milk, and 1 cup coconut milk. Stir until blended and cook, constantly stirring, on medium heat until thick. It will be lumpy but will become smooth as it thickens. Transfer into a plate and let cool. In the same wok, place the rest of the flour mixture and add the remaining one cup coconut milk, muscovado sugar, chocolate, vanilla extract, and peanuts. Mix well and cook over medium heat while constantly stirring. Turn off the heat when mixture starts becoming oily and is smooth. Transfer into a plate and set aside to cool. Pass the banana leaves over stove flame to make them supple. 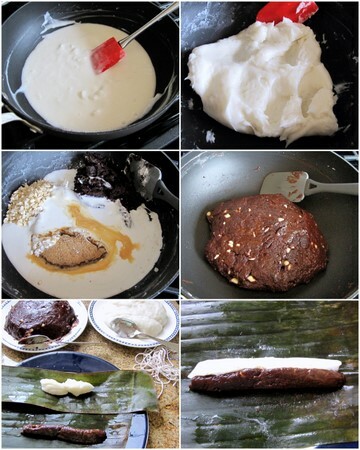 Take a heaping tablespoonful of the chocolate mixture and place on the banana leaf wrapper. Sprinkle a little cheese, if using, before rolling with the banana leaf covering the mixture and roll into a ¾ inch thick rope. Take a heaping tablespoonful of the plain milk mixture and do the same process. Place the two ropes side by side and roll to form a thicker rope with the two colors fused together. Roll the banana leaf to wrap tightly and tie a string at both ends to secure. Repeat the process until all of the two mixtures have been rolled and wrapped. Steam in rapidly boiling water for 1 hour. my goodness, i'm salivating right now. i've never tasted this type of suman, since i come from the Cordilleras. this looks good. Never had moron too but that looks definitely yummy. Am amazed at how much time you spend cooking and baking and wide the spectrum of what you try to do. That is cool. I have never had this version of suman. It looks great. that dessert looks really interesting. i've never had that type of suman before. and i've never seen that type of chocolate before; it's not available in any of the filipino stores here in s.d. Wow wow wow!! I tasted something like this from Dumaguete but this one looks more chocolate-y. Great job! Hi all, thanks....it's always great to discover a new type of yummy suman. Maricel, I finally made the empanada kaliskis. They're yummy, so flaky and tender. R, it's only recently that chocolate tableas became available at our local Filipino store. When they run out I buy them from here. The chocolate has an unrefined, earthy, and smoky flavor...very unique but some snobbish Pinoys think it's awful. We really love its flavor which reminds us of the champorrado we grew up eating. Looks very very tempting ! No doubt it must be delicious ! Yay for the moron! Thanks Oggi for featuring it! I am from Leyte and this is one of our native delicacies. It comes in many different varieties. You made the one with peanuts. There is also one that has cheese. If you find yourself visiting the Philippines, give me a heads up so I can send you some. My family knows where to order the best ones. You should also try the binagol. I think its more labor intensive to make but its oh so good! Midge, you're right, I probably have a smile when I eat this yummy suman. Sidney, you should try it when you go to Leyte for photoshoots. Raissa, I sure will, thanks. The binagol looks yummy but challenging, and I also love the ingredients. I might make some one of these days. I ate a few pieces with thin slices of aged Irish cheddar and I love the flavors too. R, you're welcome. This online store is the best in service among several Filipino online stores. oggi, wow thanks for showing this kind of suman...never encounter this suman dish before, it's a keeper=) Now I have to wait for one of my relatives to go back to the Phil to get me those chocolate tablets. This is certainly a unique version of suman! I haven't tried this before but I can imagine the sweet, nutty flavor from the tablea. Thanks! Wow this is definitely a different take on the suman... and I love it!!! Spanish chocolate + sugar + sticky rice = perfect combo! Muscovado is raw sugar...light golden brown, either coarse or fine in texture. Sometimes I see them at the sugar/baking aisles in the grocery stores or try looking from Trader Joe's or Whole Foods. You may substitute brown sugar. God bless u and keep sharing ur yummy foods!!!! hi, thank you sa pag share ng recipe ng suman moron...i really love it.nakakakain kang ako nitong suman kapag binigyan kmi ng kumpare ni tatay galing probinsya. at talagang grabe ang sarap.at ngayon ko lang nalaman na taagang kakaiba ang pagluto nito......muli salamat sa recipe at kayang kaya kong lutuin ito..GOD BLESS!! KEEP SHARING UR RECIPES IT HELPS ME A LOT..
hi! thanks for sharing this wonderful recipe of suman sa moron. i want to try this recipe but i want more sticky suman than this.can u help me on how to adjust the ingredients.?thanks! hi! 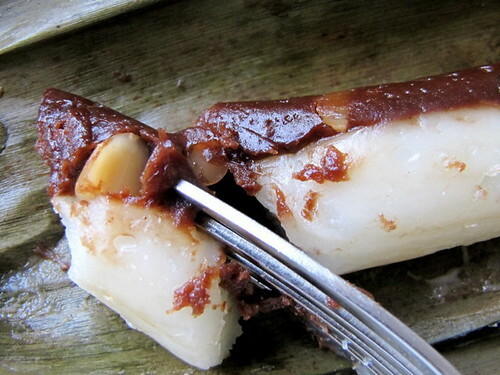 thanks for sharing this wonderful recipe of suman sa moron, i want to try this but i am confuse, because i want is more sticky suman than this. can you pls. help me on how to adjust the ingredients of glutinous rice flour and ordinary rice flour.? hanks and more power. this is my favorite suman, used to buy in Mandaue Cebu when I was in 6th grade. Missed it. We'll try to Cook it. Thanks.. I have just very recently come across this excellent blog! What we call this kind of suman in Cebu is Budbod Kabug. I don't know why it is called so but it is so, so good! Hello, thanks for posting the recipe. Can I omit the peanuts (daughter is allergic)? Will there be a big difference in the taste? Thank you! Yes, you can omit the peanuts.